Discussion in 'Transformers Fan Art' started by evilratbat, Mar 24, 2008. Well this is my version of the page 14 in the Rage in Heaven Comic am still working on the other pages as Well. At the moment got better paper for Comic work to use that is Better even for direct inking in General and dosen't smudge as much as the 80glm paper i had before so now i am using paper which is 110glm. I never thought that would make a huge difference but it did and its easier to rub lines out without the marks left. Well, as a bit of negative criticism, you don't really bring anything to the piece. I seem some ever so slight stylistic differences, but there's nothing here that warrants an "oh, cool!" reaction. Your page is virtually the same as the original. If this was simply a drawing exercise, then mission accomplished...still nothing worth writing home about, however. 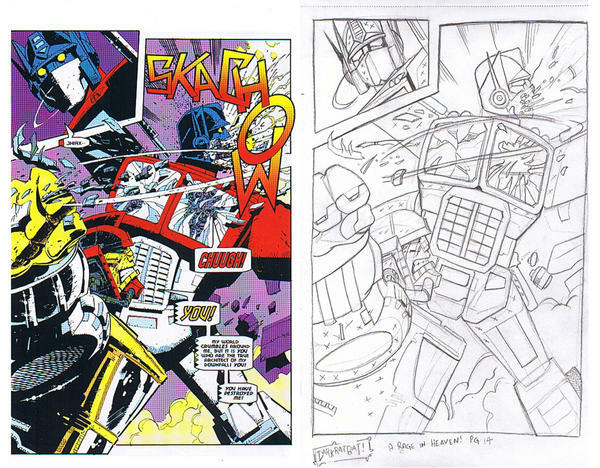 If you wanted to actually DO something with this piece, actually put your mark on it while being a good homage to the original, then you need to completely scrap what you got and rethink what you're attempting to do. As is, you've done little more than copy the original. See, on the original, I don't like the way the characters are posed. 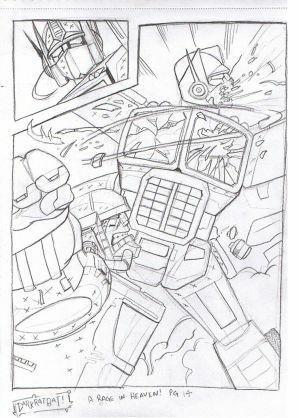 I'd have done it more an over the shoulder view of Prime, with Jhiaxus bearing down on him, and Prime rolling with the punch toward the reader. Same idea, different execution. Your own copy of it is good though. A great copy of the original. But (I assume from reading your first post) if you're redoing the comic, I'd have done little things like restaging some of the shots, doing them from different angles to show them off differently. the point of doing your own version is to change things up. its basically same perspective and composition. not much to go on there. And, yet, what's being missed here is that this was not an effortless exercise. I see this alot more on art-centric forums. One time in particular, I'd picked a handful of random drawings to reproduce* and posted the results. Expecting to be judged on the accuracy, not the work itself, imagine my surprise upon finding a lynch mob at my virtual door. *(This was a big deal for me, an outspoken proponent of distinct styles. I hate criticism that distills to "draw differently" instead of discrete technical issues, as if the artist's quirks are always unintentional. As much as I'd like to say it was a deliberate middle finger to the peanut gallery, I probably just lapsed into thinking I had something prove, though only God knows why. OK, now that I've finished derailing the discussion, I do have a few words about this particular piece. For what it is, this isn't a bad piece of art. It's a little derivative, but imitation is the sincerest form of flattery. And it looks like you really cared about the subject matter, so kudos to you for even attempting such a project. I've wanted to read G2 for years but could never get past the horrific art...I'd definitely give your rendition of it another shot if you see it through to completion. I agree with most here when they say this is just a copy. I'd like to bring a curious fact about those 'x' markings: most comic pencilers use those to indicate large shadow areas to be filled by the inker. In professional illustration we use that to indicate negative space. Comic pencilers use it erroneously because they're too lazy to fill those areas. were all just trying to point out, when making a 'your version', changing details is not enough to merit a serious discussion. i may sound curt, but this is not a baseless, derogatory comment.